On each page I get the option of meta description and keywords but don't get Title. Where can I change what appears under the <title> tag. When you are creating "static" pages with a single article menu item, the page will get its title from the menu item. At this point you have an option to override the page title, in the Menu Item settings -> Page Display. Actually the same applies, for every page of almost every front-end component, that you can create pages with their menu items. So, you can write your desired and SEO optimized Page Title for a blog category layout of articles, for which you have only created a short Menu Item title (e.g. Blog), or for the contact form page, or a the photogalery-page ect. But for any articles that are not linked directly with a menu item, for example articles that will exist in a category blog layout as the above, and are clicked from the blog page and displayed in a single article view page (note again: with not being attached to menu item), then the Article's Title will be used for page title. So, this makes each Article Title an important consideration, in terms of SEO and accessibility. Although this core functionality is adequate and allows much flexibility for SEO, I should mention that there are 3rd party extensions, that allows even more flexibility on handling your page titles and other SEO aspects. Not the answer you're looking for? 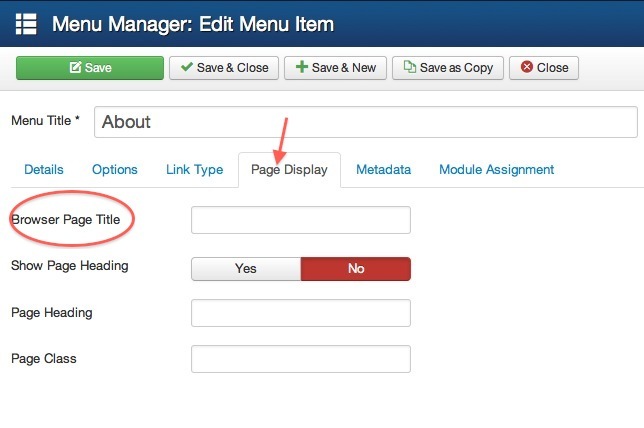 Browse other questions tagged joomla-3.x menu-item seo content menu-parameters or ask your own question. What is the purpose of page heading? How do I set the Page Title from within ChronoForms?